Climate-based daylight modelling (CBDM) is the prediction of various radiant or luminous quantities (e.g. irradiance, illuminance, radiance and luminance) using sun and sky conditions that are derived from standard meteorological datasets. Climate-based modelling delivers predictions of absolute quantities (e.g. illuminance) that are dependent both on the locale (i.e. geographically-specific climate data is used) and the building orientation (i.e. the illumination effect of the sun and non-overcast sky conditions are included), in addition to the building's composition and configuration. The term climate-based daylight modelling does not yet have a formally accepted definition – it was first coined by Mardaljevic in the title of a paper given at the 2006 CIBSE National Conference. However it is generally taken to mean any evaluation that is founded on the totality (i.e. sun and sky components) of contiguous daylight data appropriate to the locale for a period of a full year. In practice, this means sun and sky parameters found in, or derived from, the standard meteorological data files which contain hourly values for a full year. Given the self-evident nature of the seasonal pattern in daylight availability, an evaluation period of a full year is needed to fully capture all of the naturally occurring variation in conditions that is represented in the climate dataset. The exact pattern of hourly values in a standard climate dataset is unique and, because of the random nature of weather, it will never be repeated in precisely that way. Climate datasets are however representative of the prevailing conditions measured at the site, and they do exhibit much of the full range in variation that typically occurs. There are a number of possible ways to use climate-based daylight modelling. The two principal analysis methods are cumulative and time-series. A cumulative analysis is the prediction of some aggregate measure of daylight (e.g. total annual illuminance) founded on the cumulative luminance (or radiance) effect of (hourly) sky and the sun conditions derived from the climate datset. It is usually determined over a period of a full year, or on a seasonal or monthly basis, i.e. predicting a cumulative measure for each season or month in turn. Evaluating cumulative measures for periods shorter than one month is not recommended since the output will tend to be more revealing of the unique pattern in the climate dataset than of “typical” conditions for that period. The cumulative method can be used for predicting the micro-climate and solar access in urban environments, the long-term exposure of art works to daylight, and the determination of seasonal dynamics of daylight and/or shading at the early design stage. Time-series analysis involves predicting instantaneous measures (e.g. illuminance) based on all the hourly (or sub-hourly) values in the annual climate dataset. 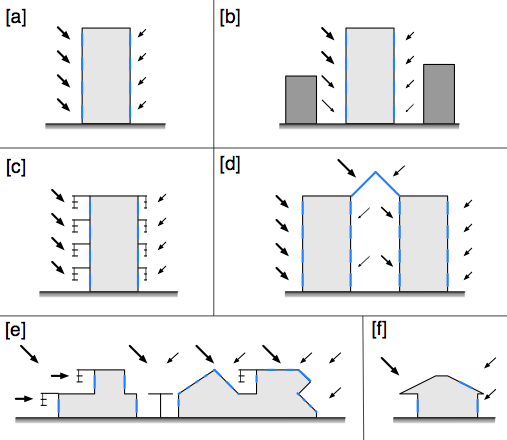 These predictions are used to evaluate, for example, the overall daylighting potential of the building, the occurrence of excessive illuminances or luminances, as inputs to behavioural models for light switching and/or blinds usage, and in assessing the performance of daylight responsive lighting controls. Evaluations founded on the cumulative approach have the potential to influence the design of the building form at the very earliest stages of conception. For example, massing studies could be evaluated in terms of their interaction with the local solar micro-climate. Fundamental decisions about the building shape would be informed by an appreciation of how the form and existing context determine the magnitude and quality (i.e. direct and diffuse proportions) of the incident daylight radiation. As the design evolves, cumulative monthly analyses could be used to disclose the prevailing levels and seasonal dynamics of daylight exposure, for both the external envelope and roughly-modelled internal spaces. The cumulative approach therefore has the potential to become a valuable tool to help guide the design of the building from the initial conception onwards. It is unlikely however to serve as the basis for a daylight metric since this would need to be founded on the likely range and degree of occurrence of instantaneous illuminances, which cannot be reliably inferred from a cumulative measure of illumination. Thus a daylight metric would needed to be based on a time-series of instantaneously occurring daylight illuminances. As noted, evaluations should be for an entire year, however only data for the occupied periods (e.g. the working day) needs to be considered. The Useful Daylight Illuminance (UDI) scheme was devised to reduce and make readily intelligible the output from a climate-based simulation without sacrificing the vital performance-revealing content of the raw data. Rather than analyse the vast amount of simulated illuminance data using traditional means, e.g. frequency histograms, cumulative plots, etc., the rationale behind UDI was to approach the data first from a human factors perspective, and then reduce it to compact metrics. Put simply, achieved UDI is defined as the annual occurrence of illuminances across the work plane that are within a range considered “useful” by occupants. The range considered “useful” is based on a survey of reports of occupant preferences and behaviour in daylit offices with user operated shading devices. Daylight illuminances in the range 100 to between 300 and 500 lux 1) are considered effective either as the sole source of illumination or in conjunction with artificial lighting. Daylight illuminances in the range 300 to around 3,000 lux or maybe even higher are often perceived either as desirable or at least tolerable. Note that these values are based on surveys carried out in non-residential, largely office buildings where daylight-originated glare on visual display devices is a common problem. Many of these surveys were carried out before LCD display panels - which are much less prone to glare than CRT screens - became commonplace. The illuminance is less than 100 lux, i.e. UDI not achieved (or UDI-n). The illuminance is greater than 100 lux and less than 300 lux, i.e. UDI supplementary (or UDI-s). The illuminance is greater than 300 lux and less than 3,000 lux, i.e. UDI autonomous (or UDI-a). The illuminance is greater than 3,000 lux, i.e. UDI exceeded (or UDI-x). For those cases where solar gain in summer must be controlled to minimise overheating/cooling, careful attention should be paid to the degree of occurrence of the UDI-x metric. Application of the UDI approach is described in detail in a study carried out for the VELUX corporation. The useful daylight illuminance (UDI) approach includes a measure of the occurrence of some set upper-limit being exceeded, in addition to the occurrence of illuminances in the preferred ranges. Thus UDI provides a measure of the effectiveness or otherwise of the architectural form to temper the daylit environment. The UDI scheme has had some tweaks since it was first proposed, and the range limits are to a degree flexible depending on the application. It is the basis of the scheme rather than the exact values assigned to the range limits that is important. Useful daylight illuminance is fundamentally different from, say, continuous daylight autonomy because, in separating out the occurrence of excessive illuminances, the measure for UDI autonomous, by default, includes a penalty for the occurrence of those illuminances that are deemed too high. It remains to be determined what occurrence of UDI exceeded is considered acceptable. It may be that the penalty effect needs to be amplified by further subtracting the UDI-x occurrence (or some multiple of it) from the occurrence of UDI-a. A 'well tempered' daylit environment is one where the fixed architectural form provides both good daylighting and effective solar protection. Thus minimising – though in practice rarely eliminating – the need for occupants to close blinds/shades. For type (a) the scope to temper the daylit environment is limited to a few basic building parameters (e.g. glazing ratio, transmissivity, etc.). Optimisation of these will have some beneficial effect, but the occupants will still have to resort to frequent use of the blinds/shades (either that or an automated system similar to that used in the New York Times HQ building). The greater the potential for richness/variety in the architectural form, the greater the opportunity for producing a 'well-tempered' daylit environment, type (b) through to (e) and residential buildings (f). A climate-based daylight metric should inform on both the under and over-provision of daylight, and so help to disclose at the design stage precisely those (daylighting) failings identified in the newspaper article. Modelling occupant behaviour in buildings adds a further layer of complexity to an already challenging process. And, importantly, a potentially considerable level of uncertainty is associated with the modelling – and therefore the output – due to the vagaries of human behaviour. There is a further issue with including the user operation of blinds/shades in an assessment of daylighting for the purpose of determining compliance with a target metric. The predicted daylighting performance (i.e. some metric) may well turn out to be largely dependant on the model and parametrisation used for the operation of the shading devices. Thus, there is the very real danger of overlooking the potential for the fixed architectural form to temper the daylit luminous environment. In other words, we might easily miss the daylighting signature of the space's architectural form because the assessment could be dominated by the (modelled) operation of blinds/shades. This is perhaps the most compelling argument against including building occupants in the evaluation of daylighting, at least in the first instance. This value usually depends on the design level illuminance. In the past it was typically 500 lux, however the value has gradually diminished in size and is now around 300 lux.